These beautiful shades of blue blend to make the perfect ombre look. 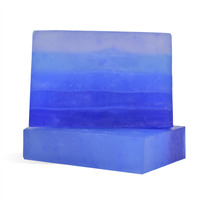 The Patchouli Fragrance Oil was chosen to give this soap an earthy fragrance. To microwave-safe measuring cup, add 43 oz. of cut up Detergent Free Clear MP Soap. Heat in microwave until soap has completely melted. Add 1.30 oz. of Patchouli Fragrance Oil and stir. NOTE: Stained Glass Violet Purple Liquid Dye can speckle. Be sure to shake bottle well before using. You may also prefer to pour the color through a strainer before using. Add 1 drop of Stained Glass Ocean Blue Liquid Color and 3 drops of Stained Glass Violet Purple Liquid Color and mix in well. Place the Loaf Silicone Mold on a scale and tare to zero. LAYER 1: Pour 8.5 oz. of melted soap into the loaf mold. Spritz with rubbing alcohol and allow to set up. 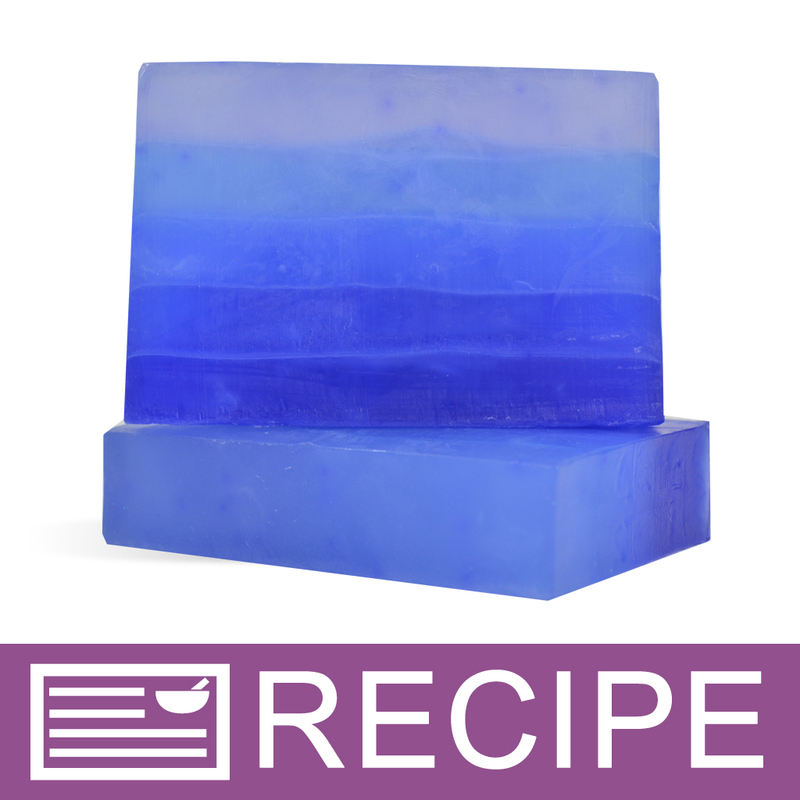 LAYER 2: Reheat soap if it has thickened.To melted soap, add 4 drops of Stained Glass Ocean Blue Liquid Color and 2 drops of Stained Glass Violet Purple Liquid color and stir well. Place mold on scale and tare to zero. Spritz soap in mold generously with rubbing alcohol. Checking that soap temperature has cooled to 130°F, pour 8.5 oz. of soap into the mold. Spritz again to dissolve any surface bubbles. Let harden. LAYER 3: Add 2 drops of Ocean Blue Liquid color and 3 drops of Violet Purple Liquid color and stir well. Spritz soap in mold with alcohol. When soap has cooled to 130°F, pour 8.5 oz. of soap into the mold. Spritz again to dissolve any surface bubbles. Let harden. LAYER 4: Add 1 drop of Ocean Blue Liquid color and 2 drops of Violet Purple Liquid color and stir well. Reheat if necessary. Again, checking soap temperature, spritz soap in mold with alcohol. Pour another 8.5 oz. of soap into mold and spritz with alcohol. FINAL LAYER: Add 2 drops of Ocean Blue Liquid color and 2 drops of Violet Purple Liquid color and stir well. Spritz soap in mold with alcohol and pour melted soap to the top of the mold. Spritz and let completely harden. 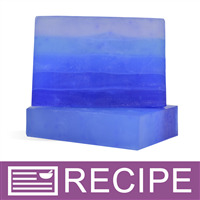 Remove soap from mold and slice using a mitre box, if available. Wrap in plastic wrap or package as desired. Ingredient Label: Sorbitol, Coconut Oil, Propylene Glycol, Stearic Acid, Water, Sodium Hydroxide, Glycerin, Fragrance, Blue 1, Ext Violet 2.